This document has been prepared to help organisations and individuals administer and prepare a Capital Authorisation Justification. Well managed projects are essential for the future success of any organisation irrespective of their funding source be it capital or revenue expenditure. The only significant difference between a capital project and a revenue project is how they appear on the Profit and Loss account. In all other respects they need to be managed with the same rigour and it is therefore advantageous to employ common processes, systems and procedures for both types of project. 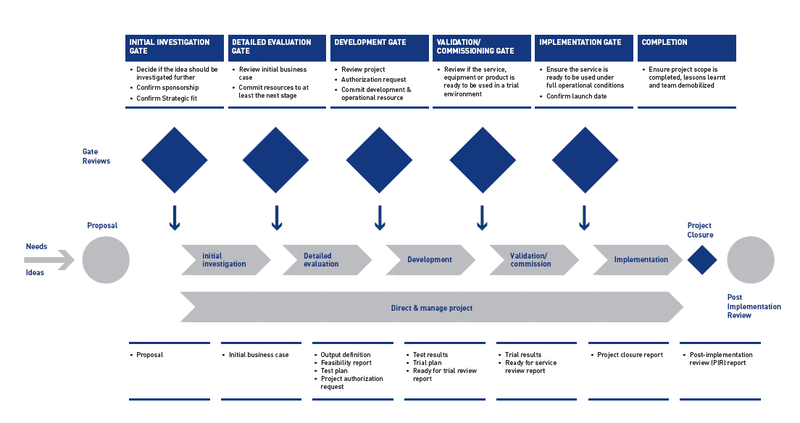 For project management to be effective it needs to encompass the entire life-cycle, from idea generation to post-implementation review utilising a stage and gate framework. A typical project framework is shown in the diagram below. Whilst preparation of the Capital Authorisation Justification may seem an onerous task it ought to be the culmination of all the work completed on a project since its inception and viewed as an important step in the wider context of the overall management of both individual projects and the portfolio of projects as a whole. It builds upon both the Proposal and the Initial Business Case documents from earlier stages which are used to commit funds and/or resource to the investigative stages. The Capital Authorisation Justification is an output from the Detailed Evaluation stage and is the document upon which the investment decision for the remainder of the project is made. It is also the document against which the success of the project will be measured at Post-Implementation Review. In many organisations the capital or project planning process is based upon an annual budgeting exercise. Often, the process is to prepare a “wish list” which is generated from the bottom up and normally produces a large number of projects for which there is neither sufficient funds nor resources to undertake. With some form of prioritisation the list is gradually whittled down so that the total expenditure requirement matches the centrally ‘allocated’ funds. The whole process is usually fairly time consuming and at the end produces a list of largely unconnected projects, with dubious strategic fit and a bias towards protecting earnings from existing operations. The emphasis is much more on producing an acceptable total expenditure figure, rather than a portfolio of projects, balanced for risk and aimed at delivering the strategic objectives. As a result of this process there is a ‘disconnect’ between the budgeting process and the individual project authorisation and approval process which, in turn, can lead to delayed projects and a marked difference in those projects actually executed and those budgeted. The subject of authorisation and the apparent contradictions in the different way many organisations treat and control their revenue and capital expenditure is vexed and the source of much confusion. Managers submitting individual projects are often very frustrated by authorisation processes and feel they have to jump through hoops and negotiate unnecessary hurdles in order to get expenditure approved. As a result much time is spent on more and more imaginative ways of breaking the rules for example by creating a series of small projects in order to keep within the authorisation level of a ‘friendly’ manager. The objective should be to identify good projects with strategic alignment and present them in such a way that authorisation becomes almost automatic because the real screening and prioritisation takes place at a much earlier stage in the process. PM PROjEN recommends a process of rolling forecasts rather than annual budgets with a planning horizon of at least three years for most organisations. The approach formally recognises projects from the idea stage onwards. Higher visibility of the portfolio together with the use of a stage and gate framework increases the focus on the strategic projects which will provide the step changes in performance, highlights project interdependences and speeds up decision making thereby eliminating frustration and the temptation to ‘work’ the system. All organisations have rules which prescribe who have authority to spend money. Such processes can be onerous and time consuming if not matched to the project processes in use. As a minimum the timing of the financial authorisation, as laid out in the finance processes, should match the gates and review points in the project framework. Each of the decision gates in the project framework offers the opportunity to allocate funds to the project. Limited amounts of money are allocated (often out of revenue budgets) to conduct the investigative stages of the project. Usually, full authorisation of (capital) expenditure for the remainder of the project is made at the Development or Execution Gate. Is the project on its own viable? What is the priority relative to other projects? The control document should be the same one for each question i.e. the Capital Authorisation Justification. This approach ensures that there is no need to write a number of different but similar documents and that you can be sure that decisions are based upon the same, compatible information. It is important to distinguish between approval and authorisation. Approval is where an individual accepts a deliverable as fit for purpose such that a project can continue or be completed. Authorisation is used for allocating the funding and resources needed to carry on the project. Approval in some form is always required before any funding is authorized. However, the converse is not true; just because authorisation of funding has been given, it does not mean that approval has been given to complete the project. Full project authorisation may be given at early stage, but subsequent gate decisions and approval points must be passed before the project can be handed over and become part of normal operations. Use scenario analysis to check possible outcomes. Do not consider financial criteria as sacrosanct. Many projects are worth doing for non-financial reasons because they support the basic strategic direction. Some things cannot be reduced to financial terms. Just because you can’t count them, doesn’t mean they don’t count! For further advice on the wider topics of effective Capital Planning, Business Programme management and the use of the Stage and Gate project framework can be obtained by contacting PM PROjEN. How a project is managed should not be influenced by the funding stream. The same rigorous procedures should be adopted to ensure the best use is made of the company resources of cash and people. Nonetheless, it is important to understand what capital expenditure is and what costs can be legitimately charged to capital. If in doubt consult your financial controller. Support or provide a solution to a necessary or externally imposed constraint (e.g., a legal or regulatory requirement). Hence, the benefits can be described as either Growth or Sustaining. Growth capital is a new cash investment that has a positive Net Present Value (NPV) when future cash flows are discounted at the appropriate cost of capital. Sustaining capital is a new cash investment that does not have a positive Net Present Value when future cash flows are discounted at the appropriate cost of capital. Expansion projects are those which generate incremental sales income associated with new products or services / new markets / new customers. Cost Reduction projects are those which reduce operating costs, reduce working capital or increase efficiency / productivity from the current operational base. Compliance projects are those which are required to comply with legislation or regulatory requirements. HSE projects are those in which there is an investment to improve the Health, Safety and Environmental performance of the organisation. Replacement projects are the replacement of assets where there is no incremental NPV benefit. Profit Maintenance projects are those which do not fit other sustaining classifications (e.g. constraints imposed by the customer required to retain existing business). Many projects should flow directly from the strategic plan, but there is no monopoly on good ideas and project proposals should be encouraged at all levels within the organisation. However, for a proposal to become a project it must be viable and have strong ownership in the shape of a Project Sponsor who is benefits focused and a Project Manager who is delivery focused. The Project Manager should be responsible for preparing the Capital Authorisation Justification and reviewing it with the project team, functional heads and other key stakeholders. The Project Sponsor should approve the Capital Authorisation Justification prior to official submission. Although PM PROjEN can provide sample or design customised documentation for Capital Authorisation Justification forms, the style and layout differ from company to company dependent upon the organisational structure and authorisation levels and processes. In this document we seek only to provide a template with a list of headings and discussion points which highlight the necessary elements of an effective authorisation request. The style and layout of the summary page varies from company to company dependent upon the organisational and business structure, the associated authorisation hierarchy and the key financial measures employed for evaluation. Describe, briefly, the background of the project and the current situation. Explain why the project came about (e.g. as a result of a strategy study, as a result of the findings of another project). Refer to any other associated projects or initiatives, business plans, or conclusions from previous studies. Describe why you are doing the project. Explain the business objectives the project will satisfy, the needs the project fills, how the project supports the business strategy. Describe in one paragraph, what the project is going to produce overall. This may be a new product, a new culture, process, manufacturing line, computer system etc. Obtaining benefits is the sole reason for undertaking a project. If there are no benefits, there should be no project. Financial – these should be stated in “money” terms (e.g. increased revenue, cost savings etc.). Non-financial – changes in operational and key performance indicators should be quantified. If you are unable to quantify a particular benefit, describe it as best you can – just because you can’t count it, doesn’t mean it does not count! Any possible events which, if they occur, will lead you to consider terminating the project. Analysis of future cash flows must be provided. The impact of competitor reaction and competitive fade must be included. Such analysis should recognise that margin advantage secured as a result of reducing the cost base of the business is generally easily replicated by competitors over a relatively short timescale. This is unless it is associated with a strong technical process advantage, which provides a significant barrier to entry. It is normal to assume with cost reduction projects that the cost advantage will be competed away within an appropriate time horizon, which rarely exceeds three years. It is important that the cash flow projections reflect the impact on the business on a holistic basis, i.e. demonstration that the investment is adding value to the business as a whole. Project expenditure should encompass the entire project including subsequent or related spend, whether Capital or Revenue, necessary to achieve the business benefits claimed. Hence the financial impact on the on-going operations must be assessed including changes in working capital. Total Net Cash Flow, NPV, %IRR and Cash payback as a percentage of capital expenditure are all useful financial measures. For all projects it is important to identify the link to the strategic objectives. Have the existing and proposed capacity requirements been addressed? Is the market analysis (size/share/competition) clear and understandable? Is it clear how the sales growth will be achieved? Is the impact on working capital understood and reflected in the financial analysis? Are the savings real and auditable? Are the savings sustainable over time? How are the incremental savings achieved? Make will make the difference between the current situation and the proposed approach? Is the legal requirement clear and understood? Have “best practice” techniques been employed? Are maintenance costs before and after the investment included in the financials? Is it clear why we need to re-invest? Are the alternatives to replacement examined sufficiently? Has the equipment utilisation pre and post investment been quantified? Have all the opportunities to improve productivity and reduce costs been identified? Is there a sufficient argument and evidence to support continuance of operations through investment? What is the profit / cash stream being defended? Have all the alternatives been identified? The functions or departments which will be effected. Note a deliverable can be created by one project only. It may, however, be used by many subsequent projects. The named individual(s) accountable for reviewing and / or signing it off. If the list is extensive, detail them in an appendix and list only the key ones in the main body of the document. Outline the overall project timescale by stating the target completion dates for key milestones. Include all staged framework milestones. Add any other significant milestones or events such as the letting of a major contract. Actions or contingency plans that may be implemented, should any risk or opportunity happen. This may be presented in the form of a risk and opportunities log. Sensitivity analysis to assess the impact on the key financial measures of a 5% and 10% change in the key “cash flow risks” should be performed. The impact of + or -5% or 10% of each risk e.g. sales volume, sales price, specific or total cost, timing etc. should be re-calculated. Scenario analysis can also be conducted which considers pessimistic, most likely and optimistic outcomes. It is important to list all assumptions and constraints, even if they appear obvious to you; they may not be so obvious to others associated with the project. Key interdependencies between subproject elements and with suppliers. Where subprojects are complex, you should consider each one formally defined by the subproject manager. Identify the Project Sponsor, Project Manager and key stakeholders. Summarise the key points from the investigative studies, stating which options have been rejected. Give the reasons for any choices made. The “do nothing” option must be considered in the analysis. The following bullet points offer general advice and can be used as a checklist when preparing a Project Authorisation Request. Make the Request obvious it should be approved and what will happen if it isn’t. Ask yourself if you would approve the money?